The wheels came off Chorley’s title-chasing bandwagon in spectacular style here in a torrid first half for the Magpies’ usually composed defence. 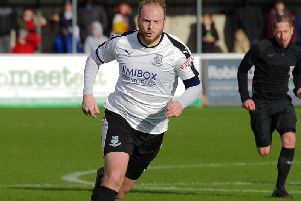 The concession of four goals before the break, three in the opening 25 minutes, effectively put the game beyond the National League North leaders, though the much-needed interval pit-stop did produce an improved second-half showing which averted a complete rout. Alex Newby had the rare distinction of bagging a hattrick yet finishing on the losing side. The Magpies fell behind in the 11th minute. Matt Urwin could not gather a swirling Dion Charles’ free-kick and Jack Sampson profited from a fortuitous rebound to head Southport in front. Indecisive defending allowed Devara Green, a real handful throughout, a free cross-shot on 20 minutes which he coolly angled beyond Urwin and five minutes later it was three-nil. Scott Leather, Courtney Meppen-Walter and Urwin could not decide who was to clear a forward ball into the box and Leather carelessly tripped Jason Gilchrist who was heading away from goal. Dion Charles scored comfortably from the spot. On the half-hour Chorley finally hit back effectively. Elliot Newby, sent clear down the left, put in a raking low centre which brother Alex tapped in at the far post. But Southport continued to unsettle the visitors’ defence and Charles glided past a couple of challenges before adding a fourth in the 37th minute. Playing with renewed belief after the break, the Magpies pulled a goal back on 56 minutes. Marcus Carver cut in from the right and drew a smart save from Dan Hanford but Alex Newby was first to react and drove home the loose ball. With 90 minutes on the clock, neat approach play down the right resulted in a low centre which Sampson converted at close range. Teague, Leather (McGurk,69), Meppen-Walter, A. Newby, O’Keefe, Carver, Wilson (Almond,64), E. Newby (Hooper,76). Unused subs. Cottrell, Jordan.